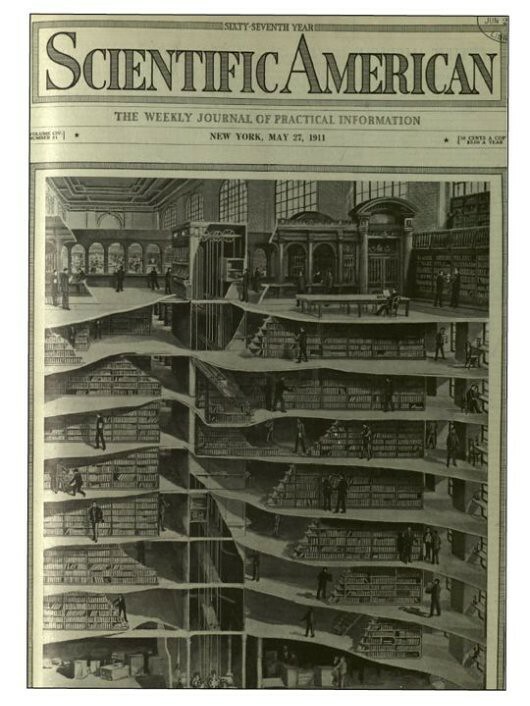 This illustration of the cross-section of the New York Public Library shows the elite library administrators filling the shelves with books as visitors read what is put in front of them. The image demonstrates that this public institution was crafted to train people into thinking a certain way. This model changed during WWII, when the library stood for “the people’s right to know.” Source: Scientific America Cover, 1911. The relationship between minorities and libraries continued to be paradoxical into the late twentieth century, varying from “Anglo-conformity” to “sympathetic cultural pluralism.” For example, at the Anglo-conformity end, social reformers emphasized “melting pot assimilation” and librarians followed along with their Americanization efforts, which were discussed previously. On the other end of the spectrum is “sympathetic cultural pluralism”, in which library services should include foreign collections, comfortable environments that allowed for the varied dress codes and manners of different cultures, community needs assessments, staff who spoke different languages, personalized contacts, and a stimulation to read as well as gather practical information for day-to-day living. In the context of this history, the next post will tell the story of Boston’s Chinatown Branch Library, how it was at first an assimilation processing center and then transformed into into an important symbol of cultural preservation. The post will also discuss the Chinatown neighborhood’s current movement to bring back this facility, which no longer exists in the community. Cuban, Sondra. (2007). Serving New Immigrants in the Library. Libraries Unlimited: Westport, Connecticut. Aditi Mehta completed her Master in City Planning degree from MIT’s Department of Urban Studies and Planning in May 2010. For her thesis, she researched the history of Boston’s Chinatown branch library, and the present-day community movement to reopen this branch. Her other series on CoLab Radio include Who’s on Broad?